Hey Winos… I know you all are in need of another reason to drink wine. So I’m here for you… to give you another excuse…. errr… reason. This morning, my ears perked up while I was listening to NPR’s Morning Edition. Yet another study has come out noting the positive effects of moderate alcohol consumption and bone density. Non-drinkers and heavy drinkers had less bone mineral density versus “moderate” drinkers who had a glass or two of wine per night. This new study was specific to women in their 50s and 60s, when “resorption” (which is the process by which “bits of bone are dissolved and new bone formed”) increases due to menopause (or those pesky hormonal changes involved with menopause anyway). The study showed that when the women stopped drinking wine each night, their bone resorption increased compared to when they had a glass of wine each night. So basically, a glass or two of wine per night led to a slower turnover rate of the bone. Why is that important? Well, because it can help prevent bone fractures. And let’s face it. No one wants a bone fracture. So why do some wines have a higher alcohol content than others? And does one type of wine consistently have more alcohol content than another? These are things about which I have wondered, but my lovely Cousin, let’s call her the Fresh Girl, had posed these questions that perhaps W2WK could answer. Oh the many charms of wine! In general, a wine has a higher alcohol content when it is made from ripe (or more ripe) grapes than wines made with less ripe grapes. The riper the grape, the more sugar there is in the grape, resulting in higher alcohol content. The alcohol content impacts the body and texture of the wine. Wines with high alcohol are “full, round, and supple; sometimes they can even seem almost thick and chewy”, like red Zinfandels. Whereas wines with low alcohol content are much lighter – like Rieslings. (The Wine Bible) If you were to compare two wines side by side, the wine with the higher alcohol content will likely be considered the better one. But this is mostly due to the fact that the grapes used to make the wine were more mature (which means riper, and more sugar, and therefore more alcohol). The amount of alcohol in wine also impacts is flavor and aroma. The flavor of alcohol is somewhat sweet, which allows a wine to also have a high level of acidity but still maintain a balance in the taste. Higher alcohol content wines will be able to handle higher acidity levels because the increased sweetness (due to the higher alcohol) will balance the acidity. (And acidity is a topic of a future post on Thoroughly Wine Know Thursday). Generally, if the alcohol and acidity don’t maintain a good balance, it’s the same satisfaction of a cup of weak coffee. And no one wants a weak cup of coffee. The following are ranges/averages of alcohol content in various wines as provided on alcohol content.com. Hopefully you now have a little more Wine Know about why certain wines have a higher alcohol content than other wines. Any more specific questions out there that I could research for you!? Thoroughly Wine Know Thursday: Drink and Be Merry… and Healthy! As if we needed another reason to drink wine… the New York Times today posted an article on potential benefits of red wine on the digestive system. Essentially, because of the fermentation process in wine making, natural pro-biotics are present in wine. And since pro-biotics are good for our stomachs and digestive health in general, drinking a bit of red wine can contribute to that healthy stomach. Check out the NY Times article here! PS: Thanks for passing this along, Sophie! I have been buying bottles of wine for many years now – from grocery stores, to warehouse wine shops, to wine bars and independent wine shops (or “shoppes” when truly cute). And in all these years, I have seen little signs hanging next to or on bottles of wines with numbers. And the numbers are often accompanied by descriptions that sound nice and have lots of exclamation points. So, naturally, as any good American consumer would, I would draw the conclusion that the number hanging off the bottle accompanied by a fancy description with exclamation points was an indication of something good. And, therefore, buy the bottle. What the heck do those numbers mean? Why are they always in the 90s and sometimes in the upper 80s? Who gives these trusty bottles a number? Upon my initial search for this info, I turned to my trusty reference book, The Oxford Companion to Wine, and found that my lack of Wine Know on this topic was really evident. I looked up “rating” and it directed me to “numbers and wine” and then to “scoring” and finally to “Robert Parker”. Not where you thought the trail would end, is it, Winos!? (I only say so because I passed over it the first time I read the reference…) So here it is – the overview on wine ratings as most of us know them…. Robert Parker is a wine dude turned wine expert (or, “Wine Know”, one might say) who started a publication in the 1970s called The Wine Advocate. While it started out as a newsletter with a small following, it grew into an international publication that has influenced the world wine market. How?… you ask? Well, The Wine Advocate was made up of tasting notes and assessments on individual wines (I’m sure it is very similar to Divine Wine Sundays….) And Mr. Parker recognized that for must of us Winos, buying wine can get a little overwhelming when standing in front of a wall (or warehouse) of wine. So he thought of a system that most of us are familiar with… and takes us back to high school. You see, we all know that a 95% on a math test is really good. And a 55% is really not so hot. So Mr. Parker applied our general school grading system and applied it to wine. He scored wines between 50 and 100 and published that score along with his detailed tasting notes in The Wine Advocate. It was an easy way for most consumers to quickly understand the assessment of a bottle of wine. Brilliant! FromThe Wine Advocate website, here is the description of the rating system – it is indeed simple and easy to understand. An extraordinary wine of profound and complex character displaying all the attributes expected of a classic wine of its variety. Wines of this caliber are worth a special effort to find, purchase, and consume. An outstanding wine of exceptional complexity and character. In short, these are terrific wines. A barely above average to very good wine displaying various degrees of finesse and flavor as well as character with no noticeable flaws. An average wine with little distinction except that it is a soundly made. In essence, a straightforward, innocuous wine. A below average wine containing noticeable deficiencies, such as excessive acidity and/or tannin, an absence of flavor, or possibly dirty aromas or flavors. A wine deemed to be unacceptable. May you Winos never find yourself drinking a bottle of wine that is “deemed to be unacceptable”. After my friend made mention of the fact that this gigantic bottle had its own name, I had to look it up to find out more. And more, I found (thank you, Wikipedia). To be honest, I couldn’t believe how many different sized bottles exist – with names. I mean, it is one thing for these wine bottles to just be bottles used for wine… but to have names!? Is anyone else surprised here?? 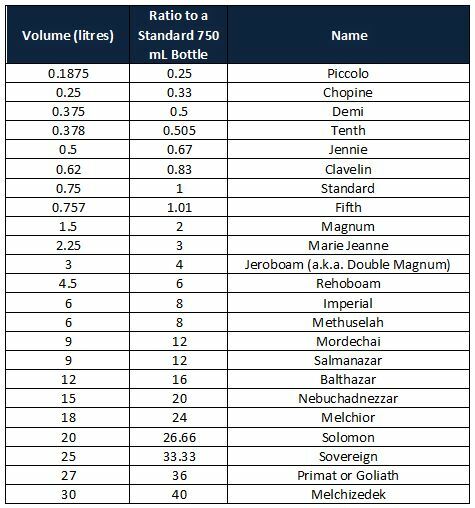 Check out the below chart showing the names for various sized wine bottles and their relative size to a Standard bottle (the typical 750mL). So you may be wondering what’s with all the Biblical names. I am wondering that too, but haven’t found an answer to it yet… more to follow, Winos. But all I can say is I will purchase the first Melchizedek I come across…. if my car can even transport 30 Liters of wine! (Who am I kidding… my car has done so often… just not in one bottle.) And I will post about it here on W2WK. That or the Nebuchadnezzar, just because I like that name… primarily because of The Matrix (even though it is spelled differently). 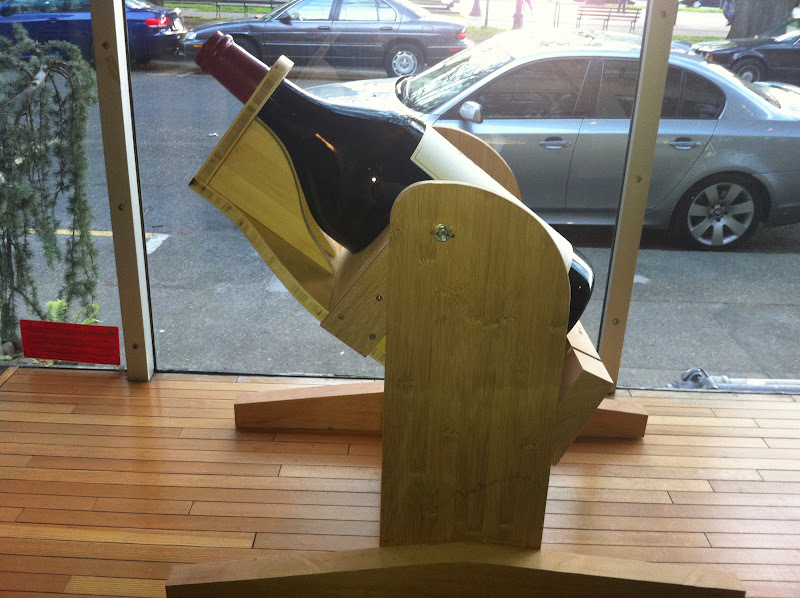 Have any of you enjoyed wine out of one of these gigantic (or tiny) bottles?? Occasionally, for Thoroughly Wine Know Thursday posts, I like to get ideas for a post by asking a friend what they want to know about wine. Today I did so, and received a response that both surprised and delighted me. Said friend said (odd use of English, I know), “I’d like to know how to pronounce the names of wines.” And today’s wine post was born…. So you never wanna be that guy… or that girl… who gets to the fancy restaurant with a fancy, special friend and suavely orders that lovely (and expensive) bottle of “bored ox”. It results only in the ashamed headshake from the waiter… and likely that special friend. So herein lies a pronunciation guide for a wide variety of wines, so that you can come across with decent Wine Know when ordering out! Did I miss any that you are wondering about? I’m a fan of tasty sauces with pretty much any meal. My problem is that – much like my love for wine with little “wine know” – I love to eat but have little “cooking know”. (Just doesn’t have the same ring, does it!?). I often want to make a mushroom sauce or spice up a tomato sauce… And I know one can do so with wine. But I usually fear adding the wine because of a fear of ruining the sauce or dish with too much or too little wine. Well, dare I say it? That and because I would rather drink the wine, but I guess that’s beside the point. So per a fews suggestions offered in one of my favorite Wine Know resources, The Wine Bible, here are some tips regarding wine and cooking. The general rule of thumb, apparently, is if you wouldn’t drink it, don’t cook with it. (Sounds logical to me!). Bottles of “wine” made specifically for cooking should never be used (according to the experts.). Why does cooking wine ruin meals? Well, I have to quote The Wine Bible to explain. “These wretched liquids are horrible tasting, cheap, thin base wines to which salt and food coloring have been added.” Yup, i’d say that sums it up pretty well. Note to self: do not buy any wretched things at the grocery store. Sauvignon Blanc wines from the U.S. are not very expensive and have a fresh, light flavor to them along with a some herbal hints. It works for a large variety of sauces. Fruity and aromatic wines might include Gewurtztraminer, Riesling, or Viognier. These wines have strong floral and fruity aromas and flavors that can help balance the boldness and spiciness of the food. So there are some simple tips on cooking with wine… May you fellow Winos pull out your sauce pans and pots to and eat, drink, and be merry! I feel the need to share this little fun fact regarding alcohol reduction while cooking. It is generally believed that alcohol burns off due to heat. But it actually has more to do with the duration of the cooking, not the temperature at which the dish is cooked. The longer something is cooked, the less alcohol will remain in the dish. For example, after 15 minutes of sautéing or simmering a dish, about 45% of the alcohol content will remain. But after 2-3 hours of cooking a dish, only about 5% of the alcohol will remain. Either way, when cooking with wine, there won’t be much since wine typically has only 12-14% alcohol content. Thoroughly Wine Know Thursday: Wine Cubes! Earlier this week, my Wine Talk Tuesday post (termed “Wine Talk Passover” for this very special week!) ended up being more like a Thoroughly Wine Know Thursday post… after all, there was so much learning (aka wine knowing) going on!! (At least for this Gentile Wino…as was called out by W2WK Friend, Sophie.) So anyway, today’s Thoroughly Wine Know Thursday post is going to be a bit more like a Wine Talk Tuesday post. That way, if you follow the posts throughout the week, you’ll end up with a Wine Fun Fact AND a little more Wine Know over the course of the week. So you know when you have a recipe that calls for a little wine to make the sauce? And you look around and think, “Damn! I finished off the bottle last night, like usual, so I don’t have any spare wine that I wouldn’t otherwise drink!” Well, wouldn’t it be nice if you could reach into your freezer and pull out a wine cube?!? I gotta say, this is something I probably won’t ever actually do… but it definitely falls in the category of something I wanna think that I would do. 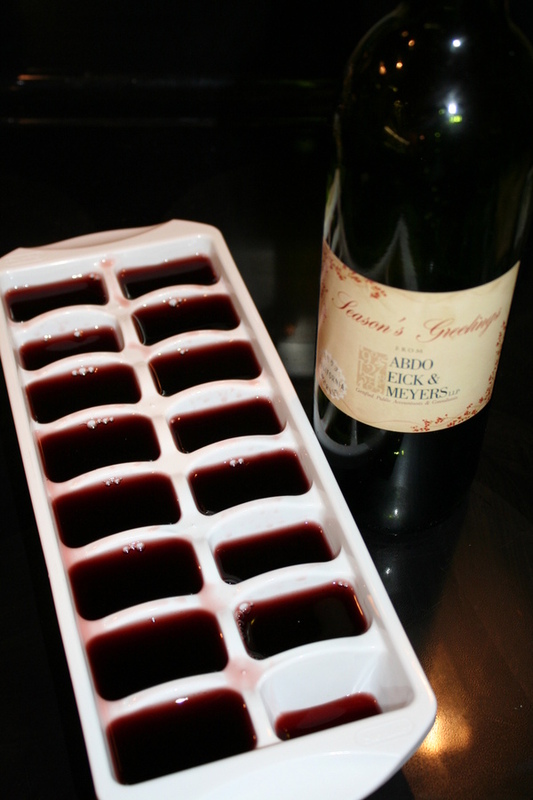 So… for the nights when you open one too many bottles, and you don’t actually finish it off, pull out that ice tray and make yourself some wine cubes. And then stick them in your freezer and use them later to make your delectable sauce. And please, if anyone actually tries this, let us know how it works out. So which is the right glass to buy? This Wino had always heard that large “bulbed” or round glasses were good for red wines so that there was more opportunity to aerate. And that smaller, less “bulby”, thinner glasses were appropriate for white wines. I didn’t have much reason for thinking that… I think I just heard that somewhere. Well, after reading up a little on wineglasses, I’ve learned a few things that I’d like to share with all of you. 1. The Word: The word “wineglass” is indeed acceptable as a single word (as opposed to “wine glass”). 4. The Fanciness: A clear wineglass – free of color, cuts, engraving, etc, – is preferred to allow the Wino to see the wine’s appearance, color, and clarity. So if you like fancy cuts and and stuff to your glass, perhaps you should learn to love the plain and simple. 6. The Stem: The stem of the glass is important. 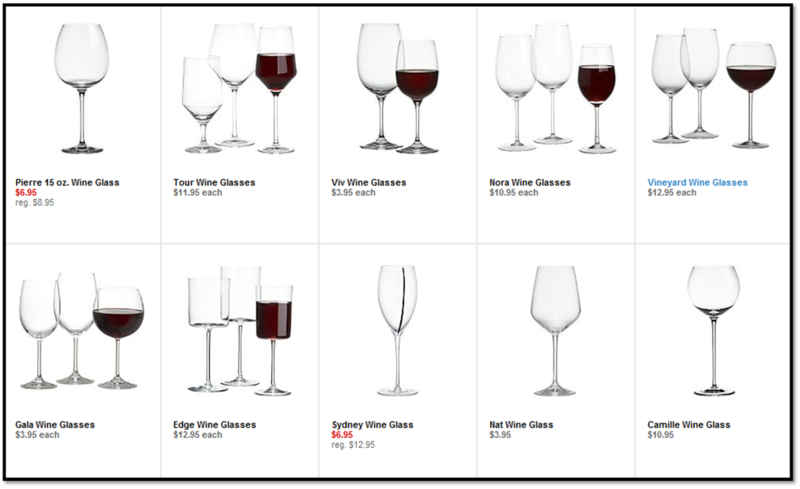 (I guess it is so important that it got a name… “stemware”.) For a couple of reasons, the stem is important. It keeps you from warming up the wine with your hand (which is bad). And it also allows you to “rotate” or swirl your wine in your glass. And if any of my MDG friends are reading, the stem also allows you to hold your pinky out while sipping. 7. The One: The same wineglass can be used for red and white wine. It really doesn’t matter. In fact, The Oxford Companion to Wine literally says, “Purists use different glasses for different sorts of wine, conventionally (although not particularly logically) a smaller glass for white wine…”. Sparkling wine (like Champagne) are best in elongated glasses, like a flute. Sherry is traditionally served in the “copita” (an elongated tulip shaped glass). Red Burgundy wine is often served in large balloon like glasses, but most wine connoisseurs don’t get too carried away with this. I know, I know. We just spent THREE WEEKS on “bottle stoppers” highlighting the different options in sealing a bottle of wine. But this series seemed to lead some of my favorite Winos to seek out alternative cork-like products. And two are so great that I had to highlight them here on Thoroughly Wine Know Thursday. Neither of these products have anything to do with sealing a bottle of wine, but both have a “cork-like” attribute. Enjoy! Yes… I did mean to type “C – O – R – K” in front of “…sicle”, not “P-O-P”. The “Corksicle” is a product that operates much like a reusable icicle to keep wine chilled at an ideal temperature while consuming the bottle. As discussed in the Wine Storage post, wines should be kept somewhere between 55 and 70 degrees. That is typically below “room temperature”. So the idea behind the Corksicle is that after opening a bottle and while having the bottle sit out, you can stick a Corksicle in it to keep it at a “balanced temperature”, and avoid the peskiness of an ice bucket, wine chiller, or wine that’s too warm. Check out the Corksicle website or watch this video below. Warning: The video gets a bit cheesy and a little overselly. That said, for only $24.95, I might think about giving it a try myself! It could be especially convenient when my Arizona home temperature is at approximately 82-85 degrees in the summer time. The Corksicle would then be a sort of magic wand for happy wine consumption! And when I do, I’ll be sure to invite Sophie over since she shared this delight of a wine product with me! So you pull out that bottle of wine on a special evening… (for me, that might by Monday night)… you find your cork screw and open the bottle with that satisfying “pop!” of the cork… you pour yourself a glass of wine and take a sip. ….And then you notice that lonely little cork laying there next to the bottle. All these years, I bet you too have been wondering how to give that little cork more after its life as a bottle stopper. Well, Winos, the answer has finally arrived… Corkers! So, if I’m seeing this right, Corkers are like Mr. Potato Head for drunk adults. 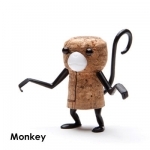 I’m pretty excited to decorate my cork like a monkey… lucky for me, I have plenty of corks available at home, but it’s too bad they aren’t included in the $44.99. 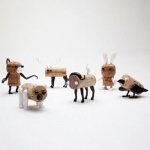 (Hmmm… business idea… sell corks to accompany Corkers.) Action Dave, thank you much for passing this amusement along!! I’ll personally make you a corker if I ever get a little “online shopping happy” one night after one too many glasses of some Divine Wine!! Hope the rest of you enjoyed these Cork-Like products as much as I did!! Please, please, please tell me if you choose to buy either of these!! Keep building your "Wine Know"! You'll get new blog posts via email. Copyright 2015 Wine Star Services, LLC.